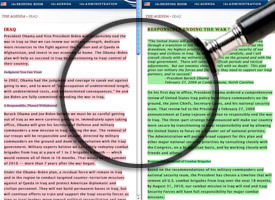 The all-seeing eye of ChangeTracker, our handy tool that watches for changes on White House Web sites, spotted a total rewrite of the Iraq agenda over the weekend. The changes reflect the new policy presented by President Obama on Friday at Camp Lejeune, N.C. Previous to the change, the agenda page was more or less a shortened version of its predecessor at the Obama campaign Web site. Nearly one-fifth of the original version was devoted to "Preventing Humanitarian Crisis," promising "at least $2 billion to expand services to Iraqi refugees and ensure Iraqis inside their own country can find sanctuary." The word "humanitarian" is absent from the new version. The new version flatly states: "Iraq's future is now its own responsibility." And in the new version, the administration states outright their interest in "preventing Iran from developing a nuclear weapon" and for "actively seeking a lasting peace between Israel and the Arab world." Hungry for more? You can sign up to be alerted -- via email, RSS, or Twitter -- as ChangeTracker spots changes. And if you're interested in creating your own change tracking system, we've tried to make it dead-simple: Check out the tutorial for instructions.